Lenovo's Reachit integrates with Cortana to search your local hard drive and various online accounts. 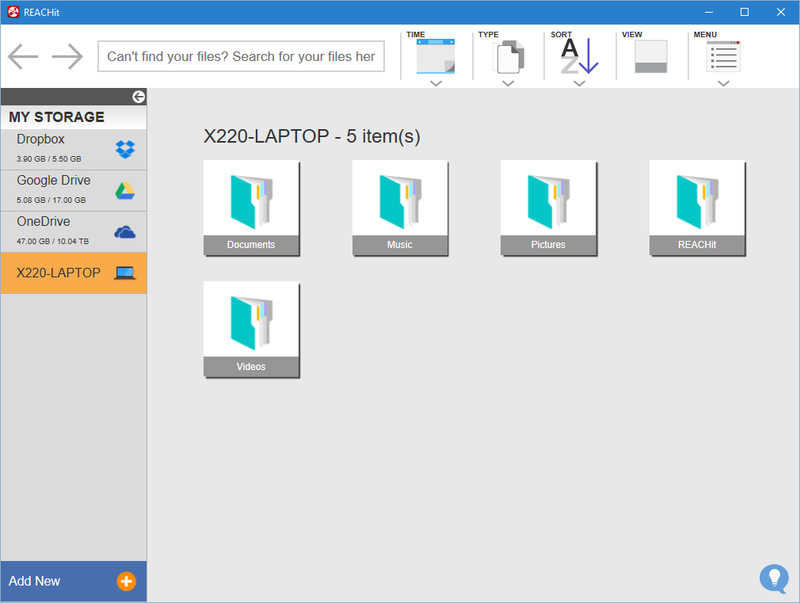 Lenovo recently released a new combination desktop program/Windows Store app that helps add even more power to Cortana on Windows 10 PCs. Lenovo’s Reachit lets you take Cortana into places it’s never been before by connecting the digital assistant to your files within the likes of Dropbox and Google Drive. Lenovo released Reachit in beta form in 2015, but now it’s available for anyone to use. The desktop program version of Reachit. First, you install the Windows Store version of Reachit. Once you’ve done that, you’ll be prompted to install a desktop program as well. This may seem redundant and silly, but it appears both components have to be available to take advantage of Reachit with Cortana. Once you’ve downloaded the desktop program, you have to sign in with an existing online account (such as Google or Facebook) or create a new Lenovo ID. I tried signing on with both Facebook and Google, but each account crashed the desktop program. Creating a new Lenovo ID worked just fine, however. After you’ve signed in it’s time to start connecting your online accounts to Reachit. Click the Add new button at the bottom of the left-hand navigation panel to open the settings window. Next, select the online accounts you’d like to connect to Reachit and follow the instructions. Reachit can connect to Box, Dropbox, Exchange accounts, Gmail, Google Calendar, Google Drive, and OneDrive. As you give Reachit (revocable) permission to access your online accounts pay attention to the account access you’re giving to Lenovo. You’ll want to be comfortable with that permission before using the program. After you’ve connected all the various accounts, check out all the other tabs in the settings window, paying special attention to the Folders area. Here is where you can modify what Reachit has access to. By default Reachit accesses your standard folders such as documents, music, pictures, and videos. If you want to add more go to Settings > Folders > Manage folder access and click a checkbox next to the folders you want. Keep in mind, Reachit lets you check the root of the C:\ drive if you want to. That’s probably not necessary and likely not a good idea. You’re better off sticking to folders in your user area, which is typically C:\Users\[your user name]. There’s also a location permission section, which allows Reachit to add location context to your actions—we’ll cover this in a moment. Once you’re done with the settings window, close it and return to the main dashboard. 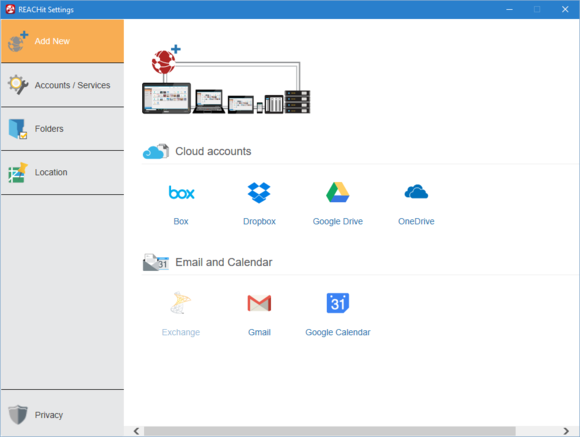 Reachit’s main interface is similar to other services that connect your cloud accounts in one place. But that’s not the real power of Reachit, so close the desktop program. 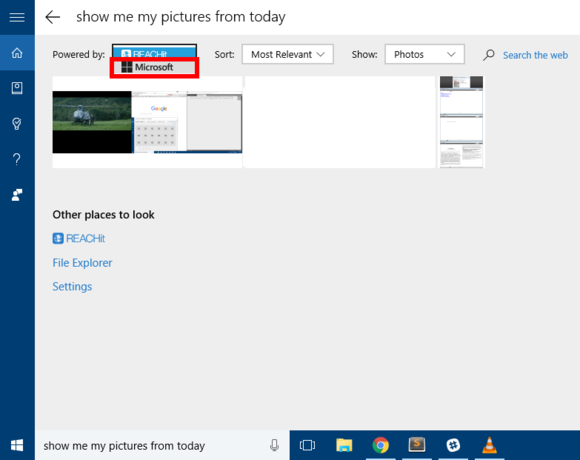 Now, let’s try some Cortana searches that use Reachit such as, “Hey Cortana, show me my pictures on Dropbox” or “Show me my pictures from New York.” If there’s anything to find (and it has the proper geo-location tags), ReachIt should help Cortana find it. As you use Reachit, the program will add location context to your files. For example, you should be able to say something like, “Hey Cortana, show me that spreadsheet I worked on at Starbucks yesterday.” If you have the location setting enabled in Reachit, Cortana will show you what you asked for. To find out all the various commands you can use with Reachit, check out Lenovo’s Reachit site. In my experience, most commands worked well, but sometimes Reachit came up short. One problem I had was that it actually canceled out some of Cortana’s regular abilities. 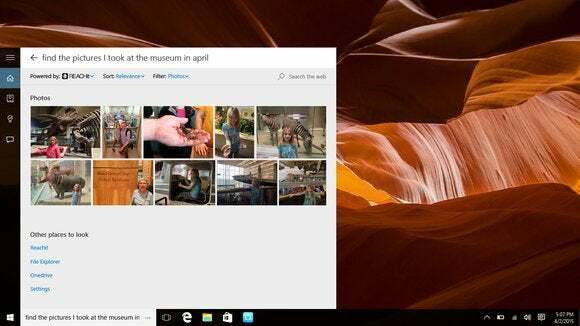 Normally, I can ask Cortana to “show me my pictures from today”—part of Cortana’s current smart search features. Reachit did that but only looked on my PC and not in OneDrive where my phone photos are automatically uploaded. You can go back to plain Cortana results without uninstalling Reachit. If you’re ever unhappy with Reachit’s results you can switch back to regular Cortana in the digital assistant’s search results window. At the top of the page there’s a drop-down menu that says Reachit. Click on that and select Microsoft to get the typical Cortana results. Microsoft plans to improve Cortana’s search features and interactions with the Anniversary Update set for release this summer. That could make some of Reachit’s capabilities redundant. Even so, Cortana doesn’t cover anything that’s stored in third-party cloud services like Dropbox or Google Drive unless it’s also on your PC. For that reason, Reachit will be worth keeping around for users who need a more expansive search function from Cortana.